Refusing to attend school can have damaging long-term consequences. 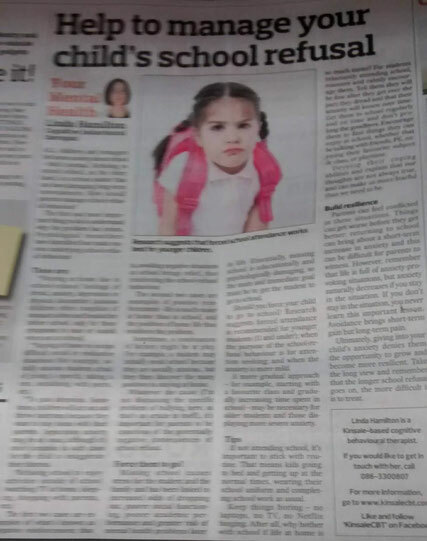 Last week's Southern Star column explored how to manage the problem of school-refusal behaviour in children and teenagers. The column is reproduced below. All children and teenagers feel some anxiety about school – that’s normal. Refusing to attend school, on the other hand, is a serious matter that can have damaging long-term consequences. How should parents manage school-refusal behaviour? The first and most important thing to do is understand why the problem has arisen. Psychological researchers have identified four main reasons underlying school-refusal behaviour. Staying at home to escape difficult social or evaluative situations (for example, socially anxious students afraid of giving a speech, taking a test, socialising with peers, etc). To gain attention. Sometimes, children will act out and throw tantrums because they want to stay home with their parents. Separation anxiety may be an issue, although it’s more common in such cases for the child to exaggerate their distress. The first two cases are examples of what’s known as negative reinforcement; that is, avoiding negative situations at school brings relief, thus reinforcing the school-refusal behaviour. The second two cases are examples of positive reinforcement – life is much easier at home than at school, and the positives of home life thus reinforce the problem. Sometimes, a combination of factors might be at play. For example, a student may initially avoid school because they are socially anxious, but they then discover the many positives to staying at home. Whatever the cause (I’m not discussing the specific problem of bullying here, as that’s an article in itself), it’s important for parents to be conscious of the potentially negative consequences of school refusal. Missing school causes stress for the student and the family and has been linked to increased odds of dropping out, poorer social functioning, poorer academic performance and greater risk of mental health problems later in life. Essentially, missing school is educationally and psychologically damaging, so the main and immediate goal must be to get the student to go to school. Should you force your child to go to school? Research suggests forced attendance is recommended for younger students (11 and under); when the purpose of the school-refusal behaviour is for attention seeking; and when the anxiety is more mild. A more gradual approach – for example, starting with a favourite class and gradually increasing time spent in school – may be necessary for older students and those displaying more severe anxiety. If not attending school, it’s important to stick with routine. That means kids going to bed and getting up at the normal times, wearing their school uniform and completing school work as usual. Keep things boring – no laptops, no TV, no Netflix binging. After all, why bother with school if life at home is so much easier? For students reluctantly attending school, reassure and calmly encourage them. Tell them they will be fine after they get over the part they dread and that their anxiety will lessen over time. Get them to school regularly and on time and don’t prolong the goodbyes. Encourage them to to find things they can enjoy at school, whether that be talking with friends, PE, enjoying their favourite subject or class, or playtime. Develop their coping abilities and explain that our thoughts are not always true, and can make us more fearful than we need to be. Parents can feel conflicted in these situations. Things can get worse before they get better: returning to school can bring about a short-term increase in anxiety and this can be difficult for parents to witness. However, remember that life is full of anxiety-provoking situations, but anxiety naturally decreases if you stay in the situation. If you don’t stay in the situation, you never learn this important lesson. Avoidance brings short-term gain but long-term pain. Ultimately, giving into your child’s anxiety denies them the opportunity to grow and become more resilient. Take the long view and remember that the longer school refusal goes on, the more difficult it is to treat.